It is not quite time to wish you a Merry Christmas. But Christmas is not too far away now. You probably don’t have time to read lots of new blog posts and I don’t have time to write them. So, this week I’m regifting (with minor edits)- a post from 2010. It is nearly Christmas, if you haven’t read the Nativity story yet, you might be reading it in a few days. There are two Nativity stories in the Bible, one in Matthew and one in Luke. Other than the Magi, we mostly ignore Matthew’s story in pageants and worship. This is understandable. Matthew’s story isn’t a happy one. It doesn’t fit well with our Silent Night, Oh, Little Town of Bethlehem, Joy to the World version of Christmas. Luke’s story is about Jesus birth. In Luke’s nativity story, there’s lots of rejoicing. Babies leap in the womb. Angels sing. Actually, pretty much everyone sings in Luke’s story. Behold, glad tidings of joy.Joy in the countryside, joy in the Temple. It’s a pretty, happy story. Matthew’s story isn’t. Not really. Matthew’s story is about the reaction of the powerful to Jesus birth. Matthew’s story is a cautionary tale. Nothing about being the Messiah will be easy. Not everyone is happy that the Savior has been born. In Matthew’s nativity the angels slip in undercover of darkness, hidden in dreams, warning of danger. Nobody is happy in Matthew’s story. Matthew’s story is full of trouble. Mary is pregnant. Joseph is asked to reject societies solution and live with the social consequences. Then he must pack up his family and flee. Refugees in a foreign land. Magi show up and succeed in finding Jesus but also inadvertently cause tragic and unnecessary death by their actions. Innocent children die, and their mothers join Rachel crying inconsolably. No one is singing. The magi flee for their lives. Herod dies but the son who succeeds him is just as bad. ( in fact, he’s worse). Joseph and his family can’t return home because it’s too dangerous and must settle in Nazareth. I wonder if they spent the next decades looking over their shoulders and wondering if Roman authorities would find them. 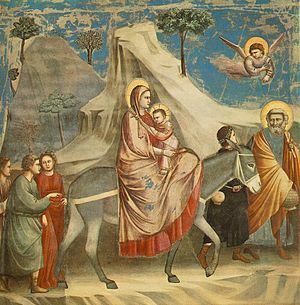 Matthew offers us the Magi and Joseph as examples of faithful disciples. But it’s not an appealing picture, disturbing dreams, running from danger, living life at the margins of proper society. And yet… even though the angels creep in at night in dreams… they do come, faithfully, reliably, opening up a way to safety. Herod uses power and deception. Herod uses all his skill. And yet… God is patiently at work. Outside the corridors of power. Outside the might of the military. Matthew’s story is a bleak one.It is as bleak as reading today’s headlines. But in the midst of the sadness and danger, God is at work. God is at work in odd places and in odd ways. The powerful are thwarted because God’s methods are beyond their understanding. Only the disciples, Joseph and the Magi recognize where God is present and working. Matthew’s nativity story tells us that being faithful,and trying to work for the kingdom of God is difficult risky business. But no matter how dark the night, God is present. Posted in Bible, Christianity. Tagged christmas, God, Jesus, Matthew. On this Christmas Eve, Merry Christmas Nancy – to you and to your loved ones.